This page will guide you from original paper submission to author registration. Click on any tab for additional information, or on the buttons to proceed. Take some time to read our PDF creation instructions before sending your paper. See below Call for Papers for details. CCECE 2018 lance un « Appel au Résultats Récents ». Nous invitons les auteurs de tous les champs du domaine du génie électrique et informatique de soumettre leur communication de résultats récents. Le format de soumission est le même que pour les communications régulières et doit être transimses via EDAS. Voir l'appel à communications plus bas pour plus de détails. The tracks descriptions can be consulted here. 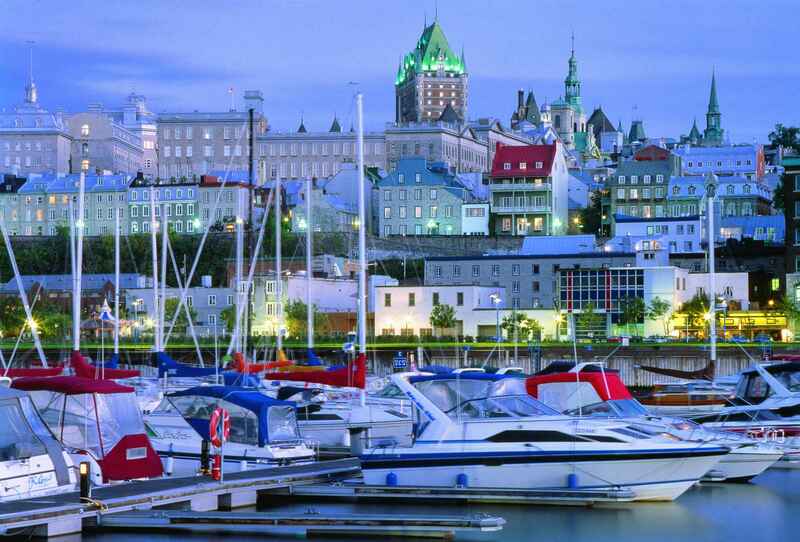 The CCCE 2018 Call for Papers is available for consultation below in both French and English. You can also download it. Papers are accepted in both official languages of Canada (French and English). However, for the benefit of all participants, one common denominator must be used and *all* papers, either accepted for oral or poster sessions must be presented in English. For proceeding publication purposes, papers presented in French must nonetheless include an abstract in English clearly stating that the paper is written in French. 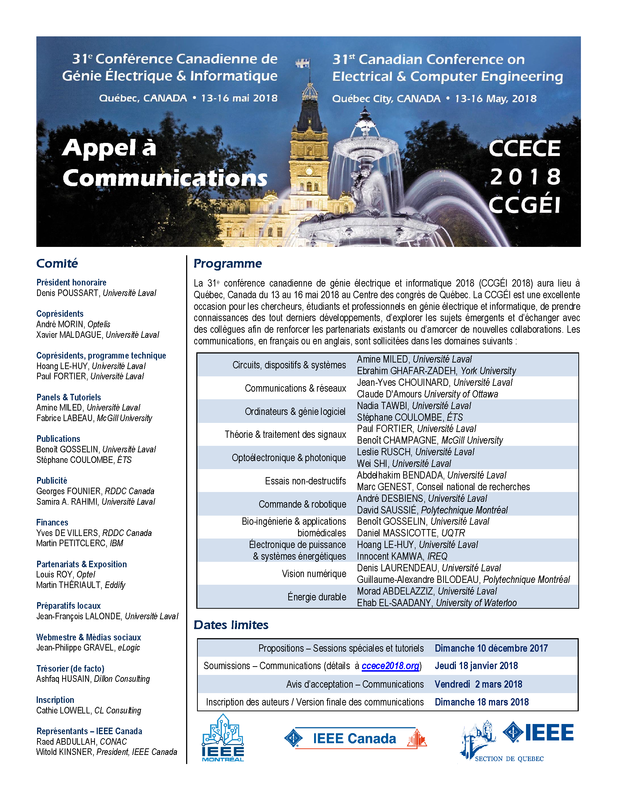 L'appel à communications CCECE 2018 est maintenant disponible pour consultation ici-bas. Vous pouvez aussi le télécharger. Les communications peuvent être soumises dans l'une ou l'autre des deux langues officielles du Canada (français et anglais). Notez toutefois que pour favoriser les échanges entre les participants, les présentations, tant orales que par poster, devront obligatoirement être faites en anglais. De plus, pour des liées à la publication des actes du congrès, les communications soumises en français devront inclure un résumé en anglais identifiant clairement que le reste de l'article est en français. 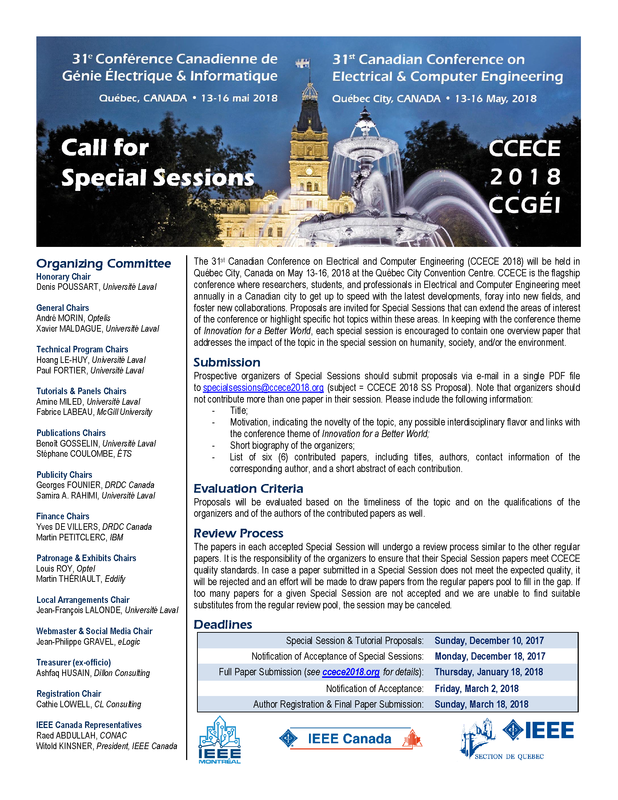 The CCECE 2018 Call for Special Sessions is available for consultation below. You can also download it. Proposals are invited that can extend the areas of interest of the conference or highlight specific hot topics within these areas. In keeping with the conference theme of Innovation for a Better World, each special session is encouraged to contain one overview paper that addresses the impact of the topic in the special session on humanity, society, and/or the environment. List of six (6) contributed papers, including titles, authors, contact information of the corresponding author, and a short abstract of each contribution. The papers in each accepted Special Session will undergo a review process similar to the other regular papers. It is the responsibility of the organizers to ensure that their Special Session papers meet CCECE quality standards. In case a paper submitted in a Special Session does not meet the expected quality, it will be rejected and an effort will be made to draw papers from the regular papers pool to fill in the gap. If too many papers for a given Special Session are not accepted and we are unable to find suitable substitutes from the regular review pool, the session may be canceled. 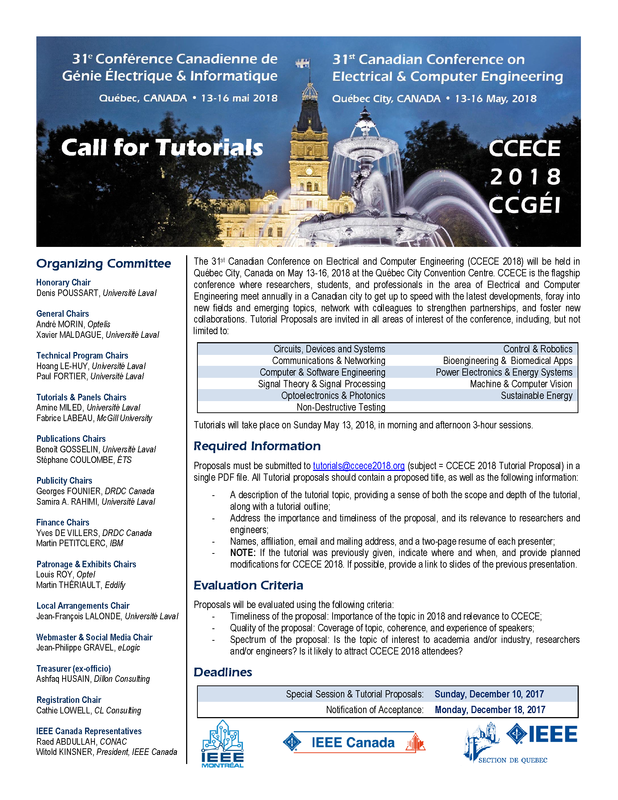 The CCECE 2018 Call for Tutorials is available for consultation below. You can also download it. Tutorials will be held in the morning and the afternoon of Sunday, May 13, 2018. Each tutorial will should be three (3) hours long, including a 30 minutes break. Proposals must be submitted to tutorials@ccece2018.org in a single PDF file no later than Sunday, December 10, 2017. Notifications of acceptance will be issued by Monday, December 18, 2017. NOTE: If the tutorial was previously given, indicate where and when, and provide planned modifications for CCECE 2018. If possible, provide a link to slides of the previous presentation. Spectrum of the proposal: Is the topic of interest to academia and/or industry, researchers and/or engineers? Is it likely to attract CCECE 2018 attendees? For authors with multiple accepted papers, one full registration is valid for one paper and the author pays an additional CAD 250 dollars for each additional paper up to a total of 3 papers. One full registration is required for every 3 papers (e.g. 4 papers will require 2 Author registrations). However, only one copy of the proceedings will be provided. 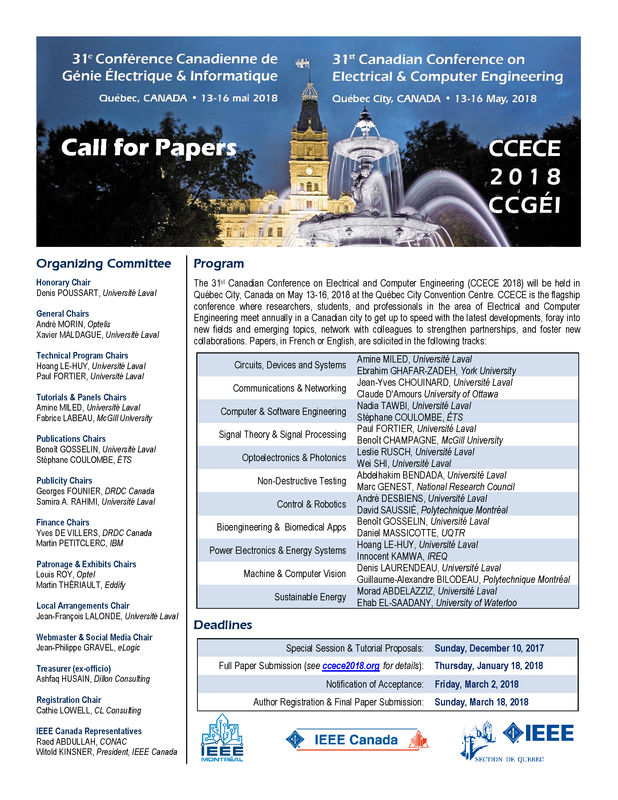 To be published in the CCECE 2018 Conference Proceedings, and to be eligible for publication in IEEE Xplore, at least one author of an accepted paper is required to register for the conference at the full (member or non-member) rate, and at least one author of that paper must present it in person at the conference. Live videoconference and pre-recorded videos will not be accepted. In some cases, the TPC may grant permission for a substitute presenter (proxy). Such proxy arrangements must be made will in advance of the event, and agreed upon in writing by one of the Technical Program Chairs. To be accepted as a proxy, the substitute presenter must be qualified to present the paper and to answer questions. Upon paper acceptation, authors be will be notified to upload the final version of their papers. This final version may incorporate minor changes as deemed required by the author(s) or as required by the reviewers. Additional details can be found by clicking on the "Final Upload" button below. All papers must be backed by at least one Author registration at either the IEEE member or non-member rate. These registrations must be received and paid by the Author/Early-Bird deadline of March 18, 2018. Please consult the registration page for further details.